Many Macintosh laptops (also some higher end iMac models) include Retina displays. These high-dpi displays are also becoming popular with higher end Windows laptops from manufacturers like Razor, Dell, Lenovo, MSI and others. When running Windows (bootcamped on Macintosh) with default settings this often results in TouchDesigner's interface appearing very small. This will occur if the display is running at a high resolution on a small monitor, for example, 2880x1800 on a MacBook Pro with Retina. The TouchDesigner interface font size can be adjusted with Windows Display Settings. 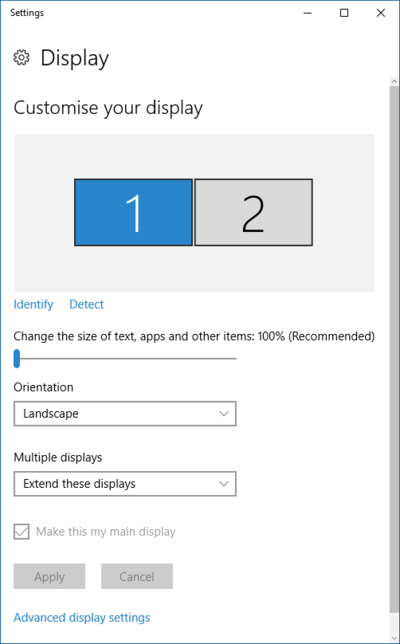 1) Open the Display Settings by right-clicking on an empty location on the desktop and selecting Display Settings. 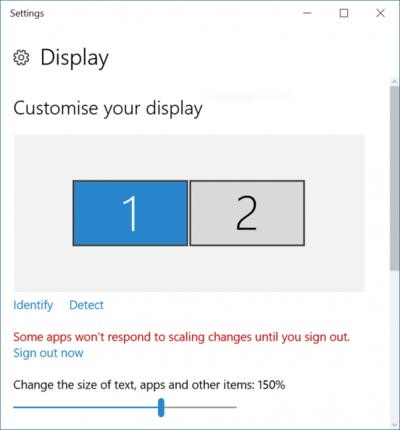 Alternatively, you can open the Display Settings from the Windows Control Panel. 2) In this dialog, note the setting "Change the size of text, apps, and other items:". 3) Increasing this settings will increase the size of the font. For example; try 150% or 200%. 4) Windows will require you logout and log back in for the settings to fully take effect. This page was last edited on 5 October 2017, at 17:26.